At the start of a forecast cycle, templates are distributed. Many business people feel overwhelmed at that point. Starting from scratch is always tough. You have to orient yourself, your have to build numbers up etc.. As a result, business people feel that forecasting resembles a fire-drill. The more often you work with a system the more comfortable you become. Users tremendously benefit from that. Their efficiency increases. 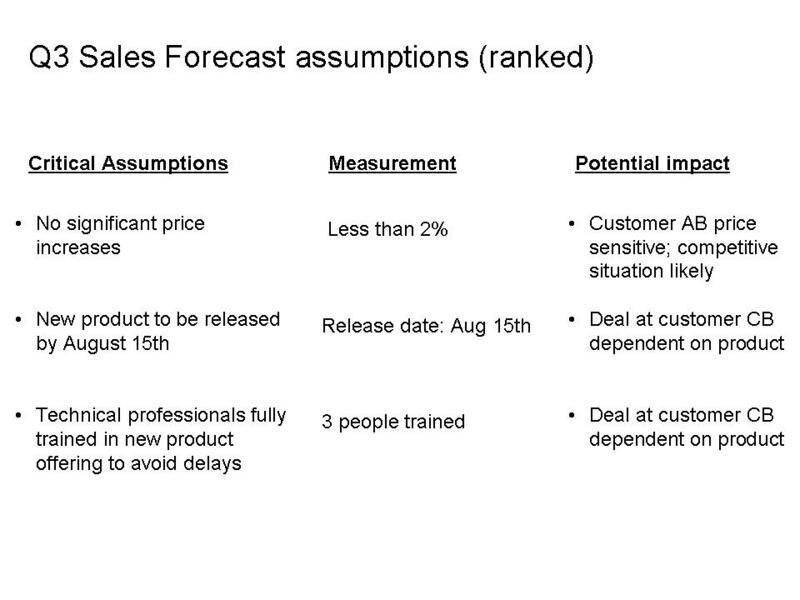 The actual forecast process is a lot faster for the business users. Finance is able to reduce cycle-time. 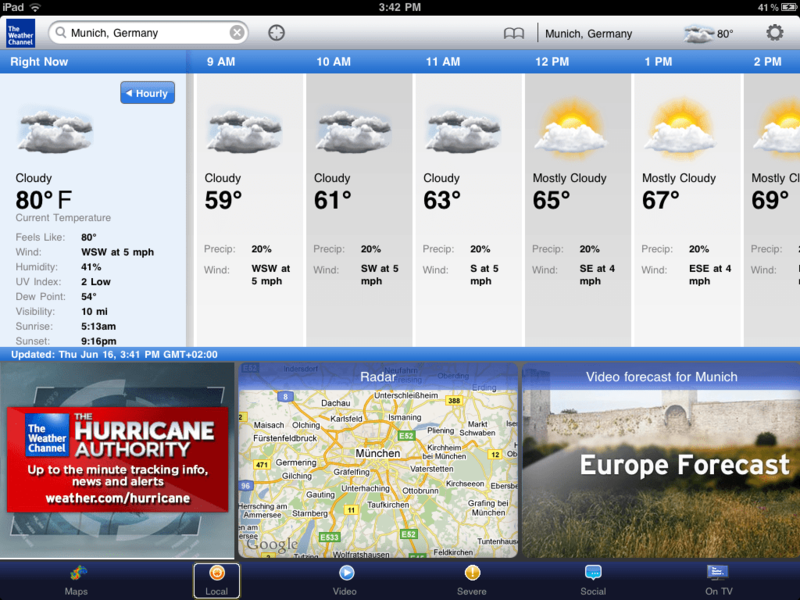 Forecasts tend to be more complete. 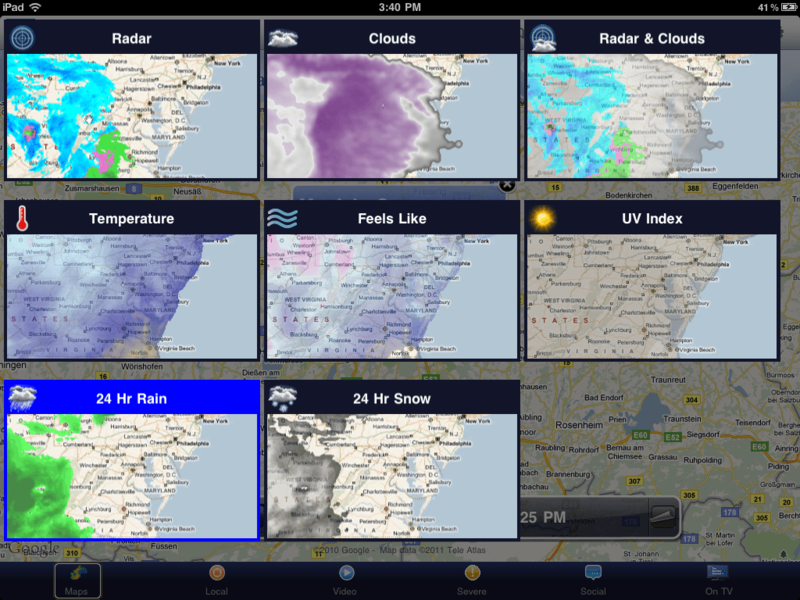 In the case of an urgent ad-hoc forecast (imagine something critical happened), the business is able to compile a near complete forecast in within a short period of time. But the Finance department now has to carefully manage this process and clearly communicate timelines and expectations to the business. Submission deadlines need to be crystal clear. Let me clarify one last thing: A continuous process does NOT mean I can simply aggregate my data every night and obtain an updated forecast. No, I need to communicate to the business WHEN I need the data. But due to the 99% availability I can collect my data very quickly. 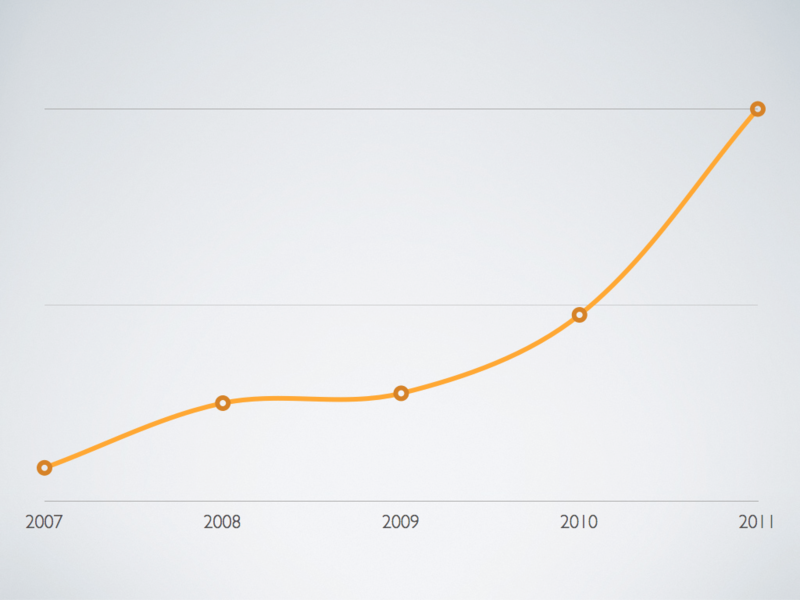 Continuous forecasting can be a powerful approach! Would love to hear your thoughts and experiences. Good or bad. If you are interested in this topic, why don’t you join of our Rolling Forecast workshops or IBM Finance Forum? The reputation of business forecasting is not positive – Time for change! The budgeting and business forecasting processes often have a poor reputation in many companies. Part of the issue is that the people involved in the process do not see a lot of value in it. Last year in November, two of my colleagues and I conducted a survey amongst 162 senior finance professionals in the UK. 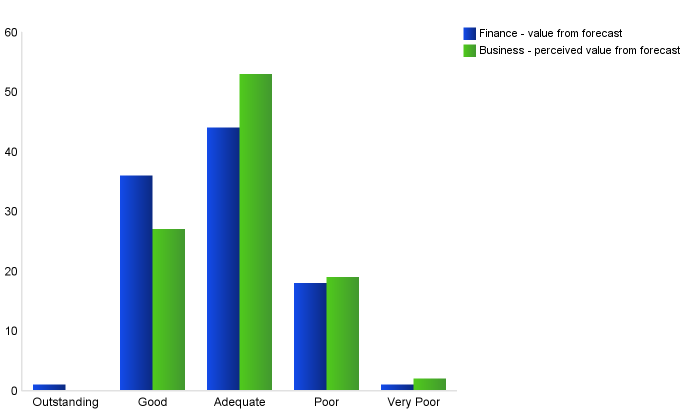 One section of the short questionnaire focused on the value and the perception of the business forecasting process. How do you rate the value that you get out of the forecasting process? How does the business rate the value they get out of the forecasting process? The results are sad – not necessarily surprising, though. Only 37% of the finance people rate the value they receive from the forecast process as good or outstanding. The rest feel it is just adequate or poor. It gets worse when we look at the business users. Less than 27% feel they receive good value. Some people might be tempted to say that the results are not that bad. Be careful, though. 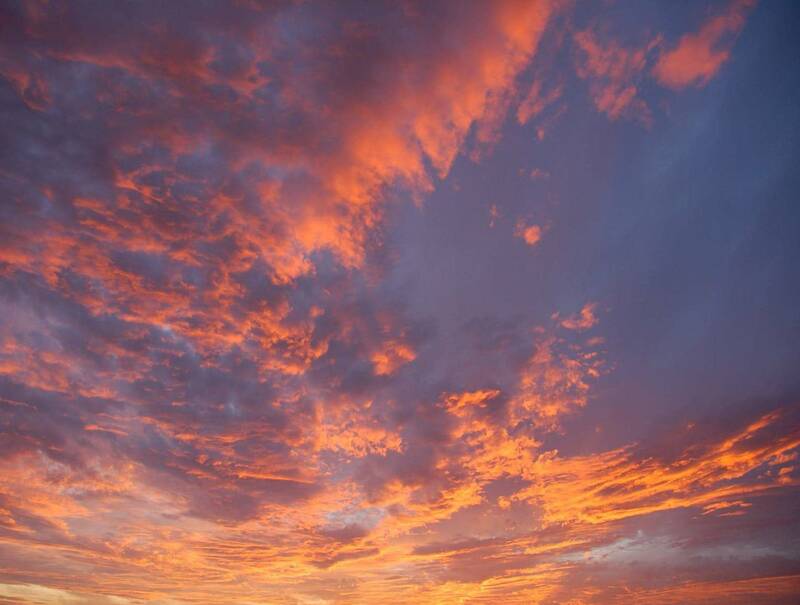 Business forecasting is a critical process in turbulent times. And it is time-consuming in many organizations. We should therefore not be satisfied with ‘adequate’ or ‘poor’. Imagine we would apply the same standard to our personal life? It would be a very sad life, indeed. Or think about professional athletes – they would not put up with ‘adequate’ materials or training plans. That would put them in the lower performance bracket. 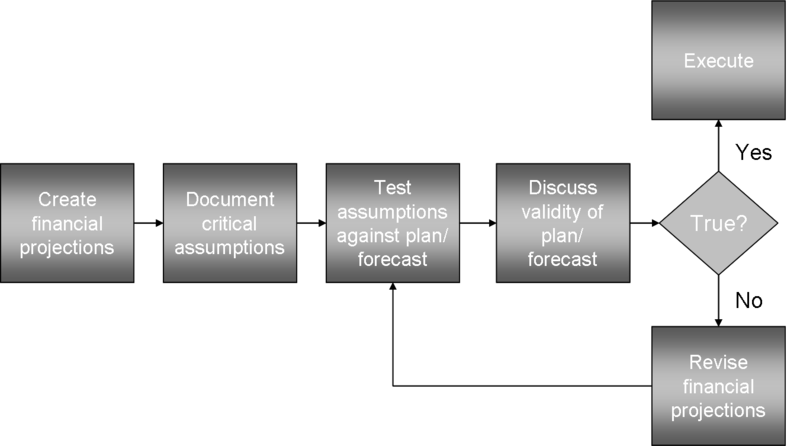 Take a look at your business forecasting processes. How satisfied is finance? What about the business? We should not accept ‘adequate’ or ‘poor’ for an answer. The stakes are too high. And we should not waste our valuable time managing low-value processes. It’s time for change! In one of the upcoming posts, I will write about some of the reasons that lead to the poor perception of the business forecasting processes. In the meantime, you can find ideas for improving your processes on this blog. Alternatively, pick up the fantastic book Future Ready: How to Master Business Forecasting . The authors Steve Player and Steve Morlidge have done a fine job of providing insightful best practices. Author Christoph PapenfussPosted on April 12, 2012 April 12, 2012 Categories Plan & ForecastTags Business Forecasting, Rolling Forecast, rolling forecast budget1 Comment on The reputation of business forecasting is not positive – Time for change! Much has been written about developing better forecasting and budgeting templates or improving the overall process. But to my surprise there is hardly any focus on the role of analysis. I have seen many organizations where managers ‘survive’ the forecasting and budgeting cycle without ever spending time performing meaningful analysis of their data. They simply focus on getting the numbers in to satisfy finance and senior management. This is a wasted opportunity. People should use that occasion to gain insights about their business. Lack thereof is likely to result in forecasts and budgets that are not meaningful. Some of you might say: ‘Wait a second! Managers do obtain some reports.’ True. They get the classic variance report with a ton of detail. But working with this is time-consuming and it is extremely difficult to identify critical trends and to see the big picture. A traditional variance report. What does it tell us? 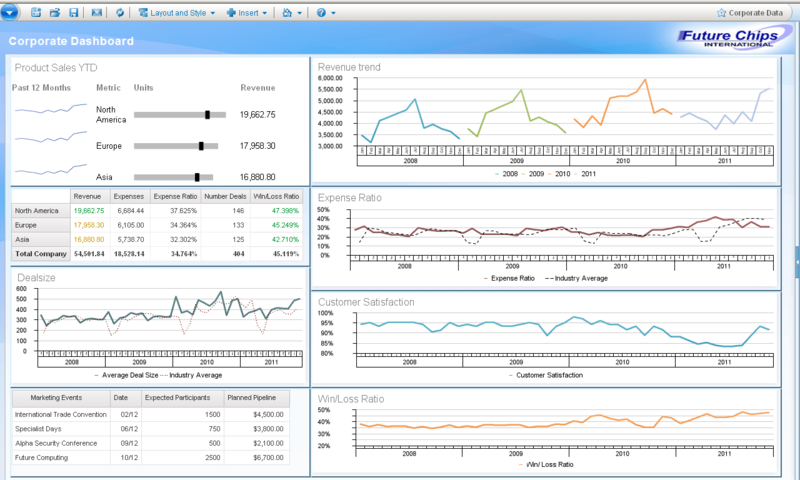 Using a Business Analytics platform like IBM Cognos 10, you can make is easier for managers to gain critical insights. Here are a few ideas that you might find useful. Let’s look at the example of a sales manager for a European division of a global company. This manager has to forecast revenue and associated expense. First of all, toss those detailed variance reports. Line of Business managers will most likely not obtain any information from them. Human beings do much better processing visual information. You can find a lot of information about this topic on this blog. So, try to swap out those hundreds of data points with a few meaningful charts. Your teams will be thankful. The variance report does not really tell us anything about our business potential. We could therefore consider looking at external data such as market trends. More and more of my clients do that. It helps them with assessing their overall position and it also helps them set realistic but ambitious targets. 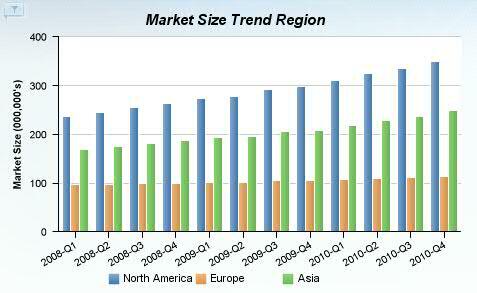 The example below shows that market growth in Europe is a bit limited compared to North America and Asia. Our biggest months used to be in summer time. But that has shifted towards year-end. 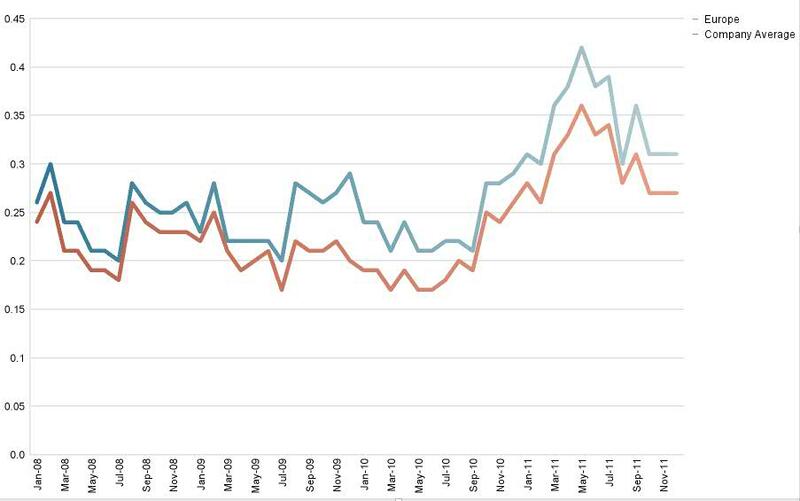 Same data – different perspective. Explore! Ok. That sounds good. But does the deal size come at a cost? Once again, let’s do some internal benchmarking and look at the ratio of expenses and the associated revenue. It looks like Europe is slightly higher which might explain the higher deal size. That information is valuable. It also leads us to think further and to ask some critical questions (Does it make sense to review our spending? Does the higher spending lead to bigger deals?). We should obviously not stop right here. 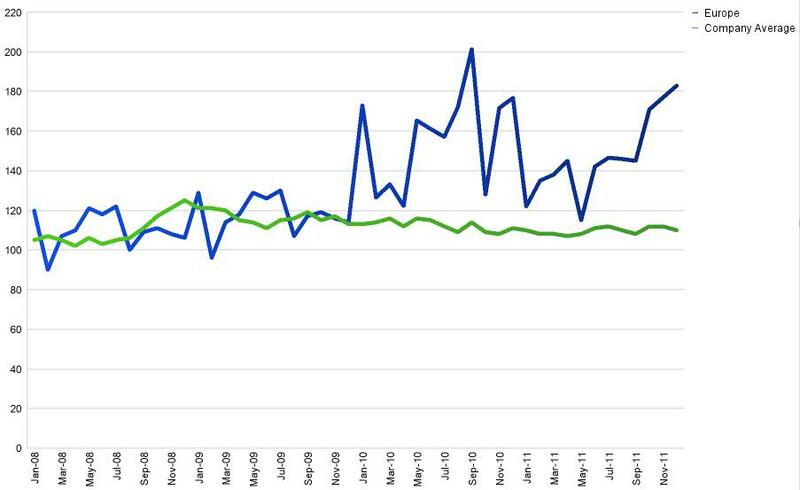 Customer satisfaction is rising again. A leading indicator for sales? These are valuable insights. And it did not take much time to obtain them. The old variance report would not have provided that insight and it would have consumed a lot of time. Try to incorporate a few of those ideas in your forecasting and budgeting processes. Doing this with spreadsheets is obviously difficult and probably explains why so many organizations are stuck with the traditional approach. Business Analytics software like IBM Cognos 10 makes it a lot easier to do that. Am I surprised? Yes. Maybe I shouldn’t. Our rolling forecasts events were popular in the past, but they keep getting more and more popular. Rolling Forecasts are indeed an important topic. And why wouldn’t they? Business and life in general is turbulent these days. No doubt about that. Just think about all the stuff that has happened this year. Major events like Tunisia, Egypt & Fukushima almost seem far away given the significant rate of change these days. And most of these events have a profound impact on the world economy. Think about Fukushima: it happened in Japan but the ripple effects created a serious tremor in Germany (the German government decided to completely pull out of nuclear energy within the next few years). Volatility and uncertainty have therefore increased the need to improve forecasting and decision making processes in almost every business. We have been running a lot of rolling forecast seminars around the globe for the past few years. The workshops are very interactive and feature a ton of hands-on best practices. We used to run them as roundtable events with a huge focus on personal interaction and discussion. But the latest series is different. My colleague and friend Mark Rolfe just blogged about it earlier this week: we have been getting so much interest that the events are no longer roundtables. We just can’t find any tables that can fit 50-150 people. The events are that popular. This week, we had over 40 people in London. Next week, we are expecting well over 40 people in Bratislava. While I personally prefer the smaller sizes (more interaction), I am certainly happy to see that companies are interested in improving these critical processes. The trend is very interesting. It seems to me that we are about to see a profound change in the way we run our businesses. The traditional annual budget process is just not working anymore. The huge popularity of these events reflects this trend. Are you interested? Please get in touch with me. You can find a description of the seminars on this blog. Also, take a look at the upcoming events in Europe. My colleague Tim O’Bryan can provide you with information about North America. P.S. : We are conducting a small survey amongst the participants. Look out for some interesting results in late November.